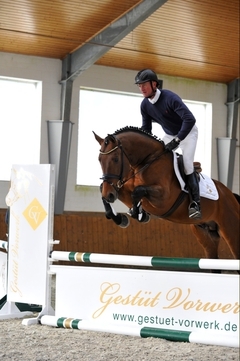 Our Sakrileg qualified for the Bundeschampionat at the Westphalian Championships in Münster-Handorf/GER. This Stalypso son received his ticket for the inofficial German Championships for five-year old show jumpers in Warendorf under his trainer Matthias Janßen. With this result, he has also fulfilled the performance requirements for being licensed to breed.